Legislation that would help encourage organ and tissue donation in Pennsylvania is now on the governor’s desk. Senate Bill 180, which unanimously passed the House last week, would expand the list of those persons authorized to decide on behalf of a decedent whether his or her organs are donated. Among other provisions, it would also permit a minimally invasive blood or tissue test to be conducted to determine the suitability of a donor; call for education regarding organ and tissue donation and transplantation for high school students, as well as nursing and medical students; and increase the voluntary contribution made by citizens from $1 to $3 for driver’s license and vehicle registration renewals. Currently, more than 8,000 Pennsylvanians are waiting for an organ transplant. More information about organ donation in Pennsylvania is available here. Legislation to expand eligibility for the state’s PACENET prescription drug coverage program passed the House last week and is headed to the governor’s desk to be signed into law. Up to 17,000 Pennsylvania seniors are expected to benefit from this expansion. House Bill 270 would increase the annual maximum income limits in the PACENET program to $27,500 for a single person and to $35,500 for a married couple. Current maximum income requirements for the PACENET program, which covers those individuals with incomes exceeding PACE maximums, are $23,500 for a single individual and $31,500 for a married couple annually. Additionally, the bill would allow two new pharmacy-based programs to be developed under the PACE program to assist seniors in monitoring their prescription drug usage. This eligibility expansion would be the first since 2004, and it is funded by proceeds from the Pennsylvania Lottery. There is still space available for veterans and U.S. military personnel residing in the 106th Legislative District to attend my Nov. 8 Veterans Breakfast. 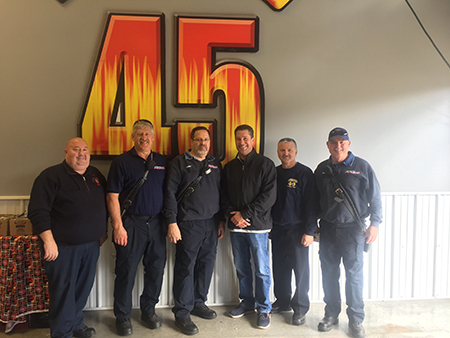 The breakfast will take place from 10 a.m. to noon at the Lower Swatara Volunteer Fire Department, located at 1350 Fulling Mill Road, Middletown. Seating for the event is limited and registration is required. To register, contact my district office at 717-534-1323, no later than Monday, Oct. 29. Veterans requiring assistance due to a disability are permitted to bring a guest. Originally open only to veterans residing in care facilities, the Nov. 8 breakfast was opened to all veterans after my second Veterans Breakfast (Nov. 9) reached full capacity. 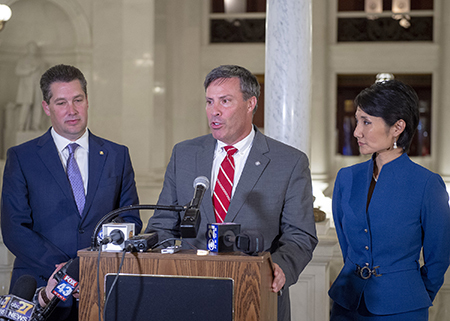 My colleagues, Rep. Greg Rothman, Rep. Patty Kim and Senator John DiSanto, and I celebrated the passage of legislation this week to allow Harrisburg to exit Act 47 status. This is good news not only for Harrisburg city residents, but all those who work and visit the city daily. We worked hard to come up with a commonsense solution that does not require raising property taxes or creating a commuter tax. Thanks to this great bipartisan and bicameral effort, the final piece of the puzzle is in place to help Harrisburg continue down the path to economic revitalization. I look forward to the bright future ahead for our region! The bill is now on the governor’s desk. A bill I supported to help grandparents who are the sole caregivers of their grandchildren is headed to the governor’s desk to be signed into law. House Bill 1539, specifically aimed at helping those affected by the opioid crisis, would grant temporary guardianship to grandparents when the parents of the grandchildren are unable to care for them primarily due to substance abuse issues. Previously, grandparents had no legal authority to enroll children in school or make basic medical decisions for them. In Pennsylvania, an estimated 82,000 grandparents are the sole caregivers of nearly 89,000 grandchildren. Research has shown that children achieve higher levels of success when they’re able to stay in a stable household situation with close family members. In addition to that, grandparents keeping their grandchildren out of the foster care system saves the state over an estimated $1 billion per year. To make it easier to report concerns on state roads, PennDOT has modernized its online customer care center. The new website will include new mapping capabilities, optional photo uploads and a mobile-friendly interface. Concerns are sorted into several categories: road or bridge conditions; removing debris from a roadway; traffic, signs or signals; ongoing roadwork or projects; or general questions and concerns. Motorists are asked to be as specific as possible when providing locations of concerns. Motorists should report the county, municipality, street name and state route number, which can be found on small black and white signs posted along state highways. In addition, a description of any familiar landmarks are helpful for PennDOT to locate the problem area. As of Sept. 30, the previous Customer Care Center had nearly 45,000 concerns submitted this year, according to PennDOT, with more than 96 percent of those concerns being resolved. Residents who are struggling with their home heating bills can apply for assistance from the Low-Income Home Energy Assistance Program (LIHEAP) beginning Wednesday, Nov. 1. LIHEAP is a federally funded program that helps individuals and families pay their heating bills through home heating energy assistance grants. It also provides crisis grants to help in the event of an emergency or if a resident is in danger of losing his or her heat due to broken equipment, lack of fuel or termination of utility service. The income eligibility guidelines for LIHEAP are set at 150 percent of the federal poverty income level. For example, the income limit for an individual is $18,090; for a couple, the limit is $24,360; and for a family of four, it is $36,900. Residents may apply for LIHEAP online or by contacting the Dauphin County Assistance Office at 717-265-8919. 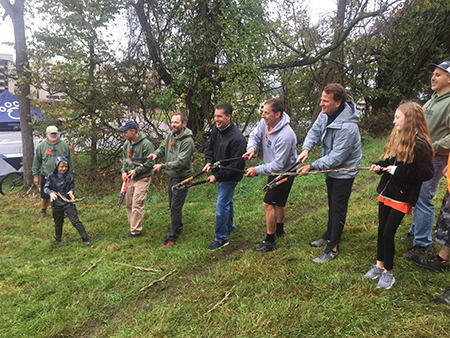 On Saturday, I joined the Susquehanna Area Mountain Bike Association (SAMBA) and Penn State Health for the grand opening “vine cutting” celebration for the new PSU-Milton S. Hershey Medical Center Trail System, a 10-mile recreational trail on and around the medical center campus. 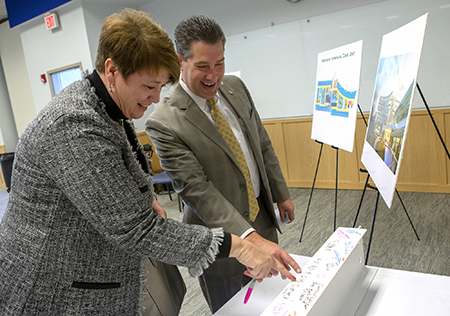 This week, I announced the good news that a $2 million Redevelopment Assistance Capital Program (RACP) state grant will be awarded to Penn State Children’s Hospital for completion of its three-floor expansion. The grant will be used to support the approximately 126,000-square-foot addition, which will provide space for a new labor and delivery unit and post-partum patient rooms, as well as a new neonatal intensive care unit — all of which will be relocated from their current locations in the adult hospital. I had the opportunity to attend the final beam signing for the expansion on Thursday. For more information on the expansion project, click here. 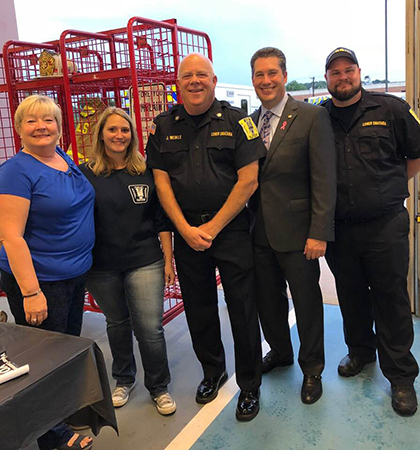 Last week was National Fire Prevention Week and many local fire stations held open houses in their communities. 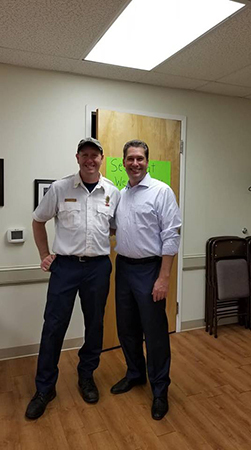 I stopped by events at Hummelstown Fire Company, Lower Swatara Volunteer Fire Department and Rutherford Fire Company 45 to thank the volunteers for their dedication to our community. Earlier this month, the Penn State Children’s Hospital hosted a lunch and learn briefing at the Capitol for staff and lawmakers. 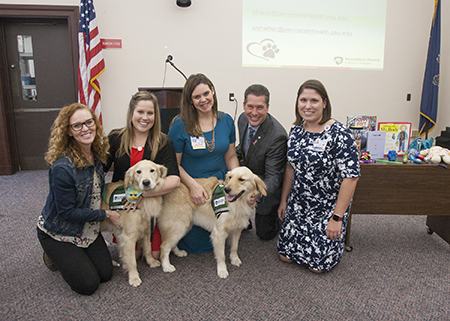 The program featured an overview of the Children’s Hospital mission and its facility dog program, as well as a discussion of the Child Life program, which provides psychosocial support, diagnosis education and normalization opportunities to children and families receiving care. Pictured with us above are Kaia and Becky, the hospital’s two facility dogs.